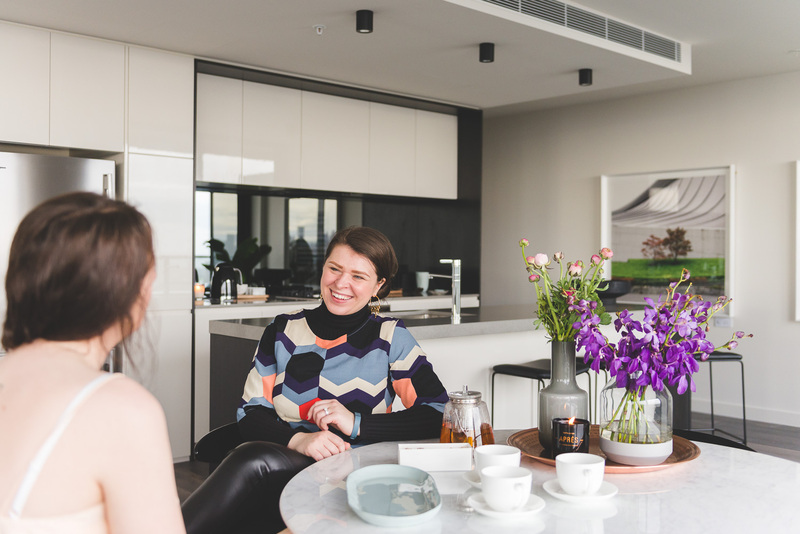 And whilst the TRES-styled interiors of our home-in-the-sky were VERY hard to leave, we were keen to see what living at Central South Yarra would be like ‘on the regular’. 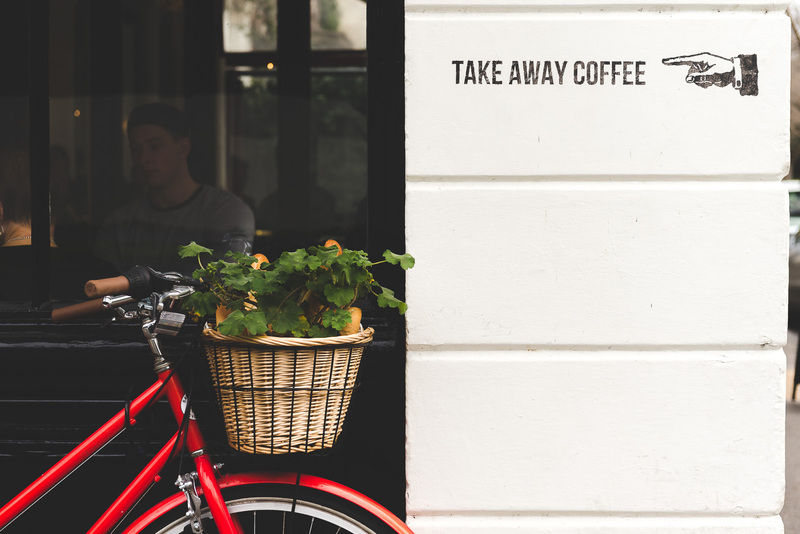 Where would we go for a jog, find a good coffee, pick up some flowers and have a browse on a lazy Saturday morning? Often called the ’10 Minute Suburb’ – South Yarra offers its lucky citizens so much culture and beauty within a 10 minute stroll. 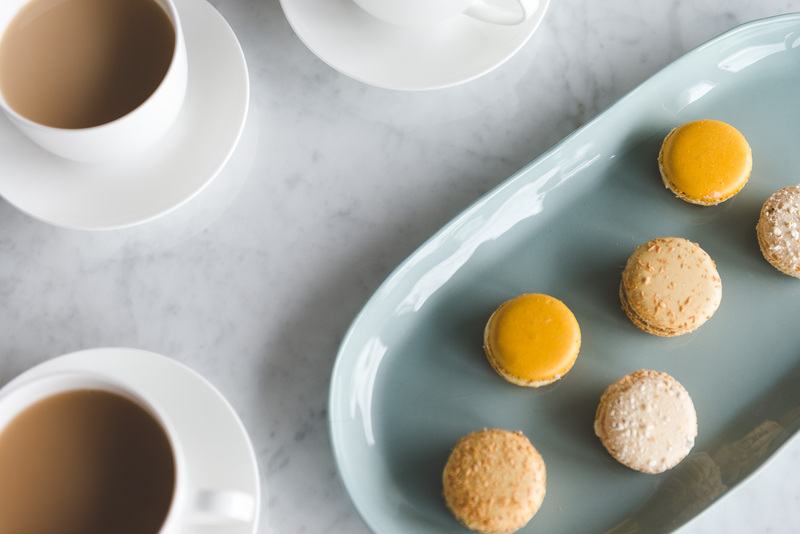 In today’s Hometruths Melbourne x Little Projects blog, we take you with us on a mini-adventure from our Central South Yarra abode – and show you exactly how sweet your southside lifestyle could be. Setting off on a rather blustery winter day, we headed north along Yarra Street, past South Yarra Station and alongside the redbrick grandeur and lush green playing fields of historic Melbourne High School (There’s another perk! If you have kids, they won’t have far to get to class.). Strolling along Alexandra Avenue towards the Botanical Gardens, you really get a sense of the history of South Yarra – a mixture of gorgeously aged Hollywood-style art deco blocks (I can imagine generations of twenty-somethings sharehousing there, making their first forays into adult life in the city), Cape-Cod inspired homes with meticulous gardens (peach tea on the porch in a polo, anyone? ), 1970’s dreamboats looking over the river with their brown brick and glass facades (the location of real-time Don’s Parties in days of yore) and of course, modern architect-designed apartment buildings like Central South Yarra, too. Crossing the road, I strolled along the Yarra River as cyclists, joggers and power-walkers passed by me. Living in South Yarra means tearing up your gym subscription (and probably your taxi passes, too): with easy access to running tracks including the Tan and safe cycling paths right into the heart of the city. Gazing along the Yarra’s long familiar bends, dotted with icons such as the Nylex sign, AAMI Park and towards the soaring scrapers of our city – you’re no more than a 20 minute walk from Melbourne’s sporting, retail and business hubs. 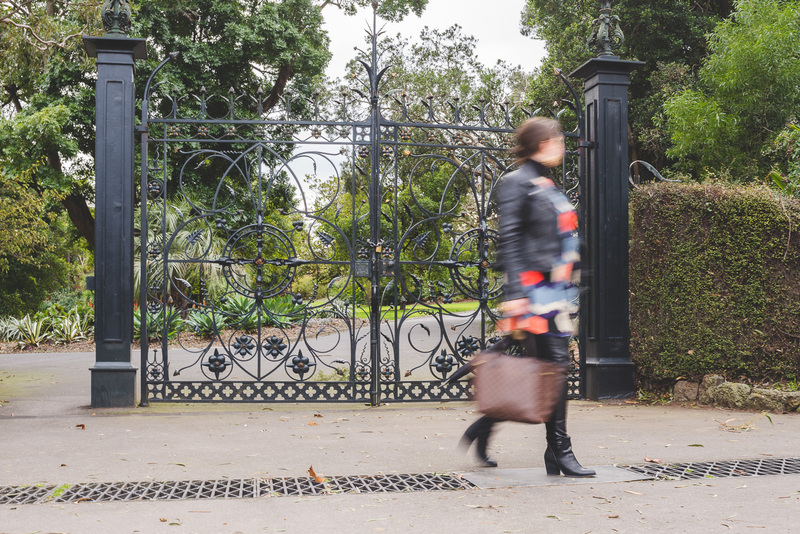 The ornate lace ironwork of the Royal Botanic Gardens – a perfect place for casual Spring picnics with mates, Royal Shakespeare Company garden performances on Valentine’s Day or nights at the Moonlight Cinema with a glass of bubbles and lots of imported cheese. What’s a morning walk without a coffee? I know you’re asking this question somewhere in your subconscious right now. A morning without coffee is not much of a morning, indeed! 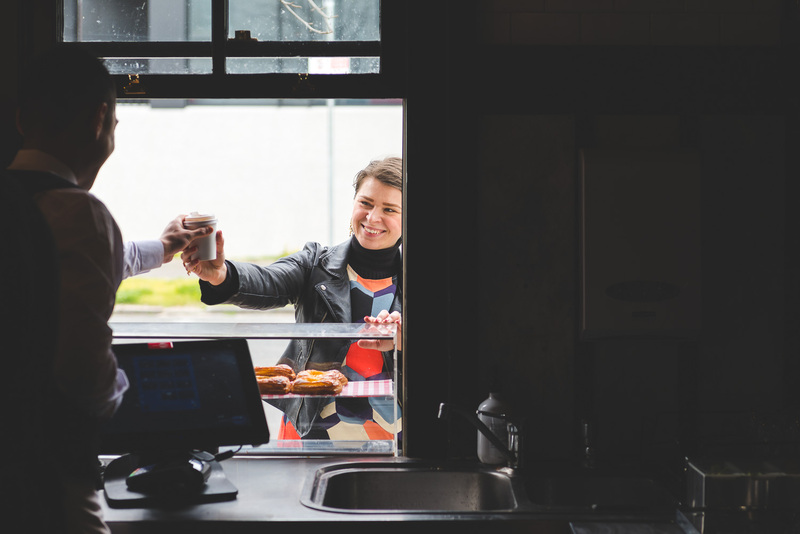 That’s why I was excited to learn that Melbourne’s latest cool kid of the southside – Entrecote on Domain Road – has a self-proclaimed ‘Magic Millswyn Window’ from which they distribute both bonhomie and takeaway coffees for only $2.50. I KNOW, RIGHT?! 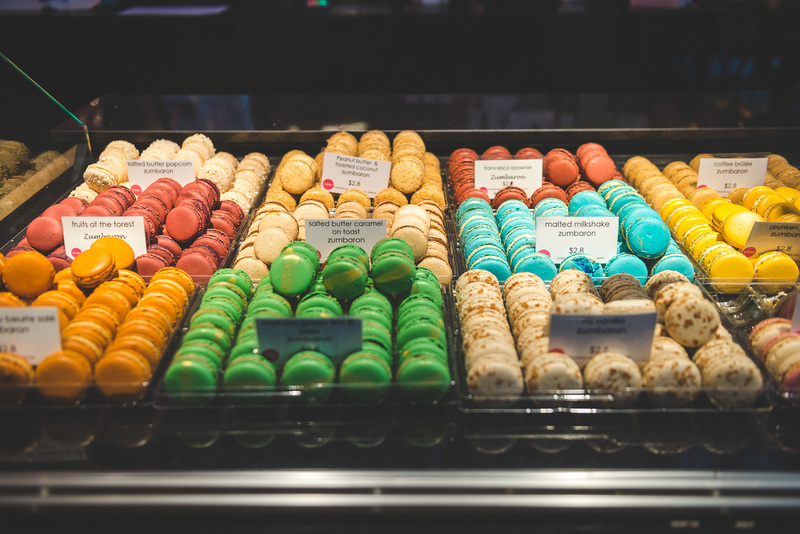 Grab one to pep you up while you perambulate around the Tan clockwise, and then come back to Entrecote again for their signature ‘golden folded eggs’ while sitting in their frenchy-chic surrounds with your best ami. Best known for their legendary steak frites (with endless frites I KNOW, RIGHT?! ), Entrecote is the cherry on top of South Yarra living in 2015. Cheeky Entrecote barista Dennis (who told me his Greek name was Dionysius, the God of Wine and Party) makes a mean takeaway coffee and delivers fine repartee, too. Fully caffeinated, we headed back along Domain Road past The Botanical Hotel (a great place to begin your morning before Portsea Polo or the racing season) and spotted something humorous in the window of Domain Dry Cleaners on Park Street: rack after rack filled with carefully laundered Santa suits. If South Yarra is good enough a postcode for Santa to do his annual laundry, surely that is tick of approval enough for us mere mortals! 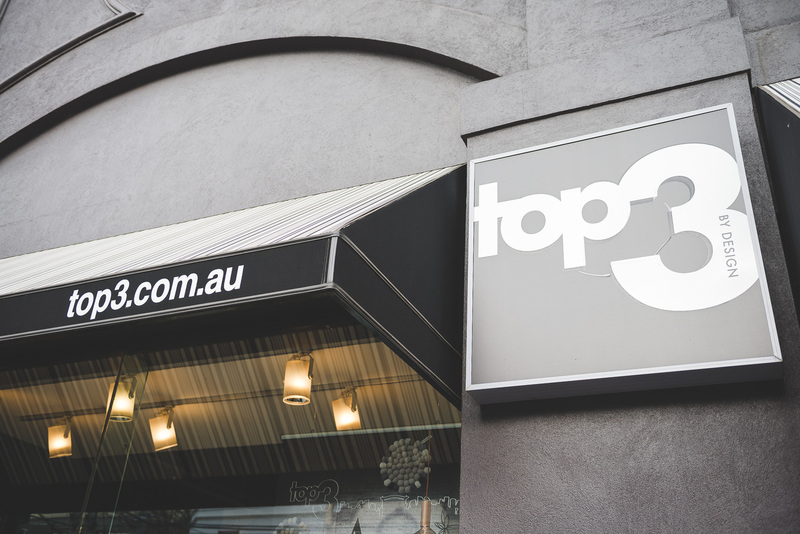 Turning off Park Street opposite lush Fawkner Park, we cruised down Toorak Road before coming to our design mecca of choice: Top3 By Design. 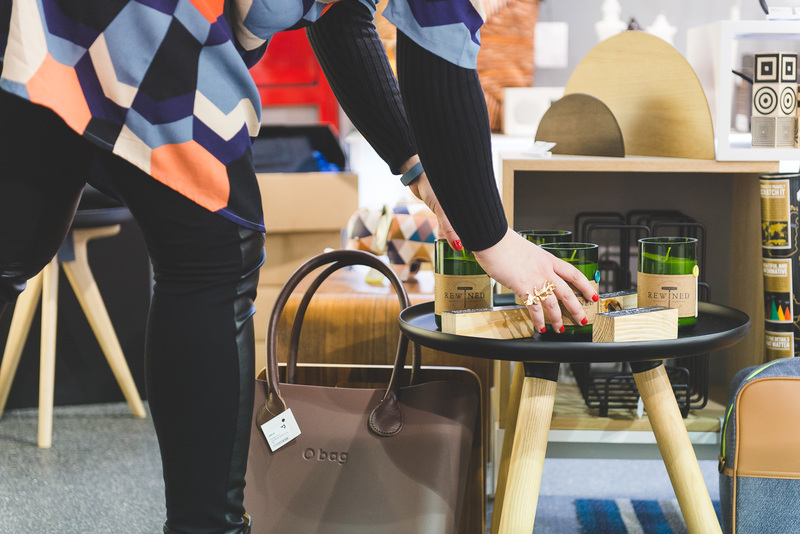 Top3 By Design pieces featured heavily in our Central South Yarra apartment – and having had our palette for fine things duly whetted, it was a treat to go in store and see what other treasures they had! 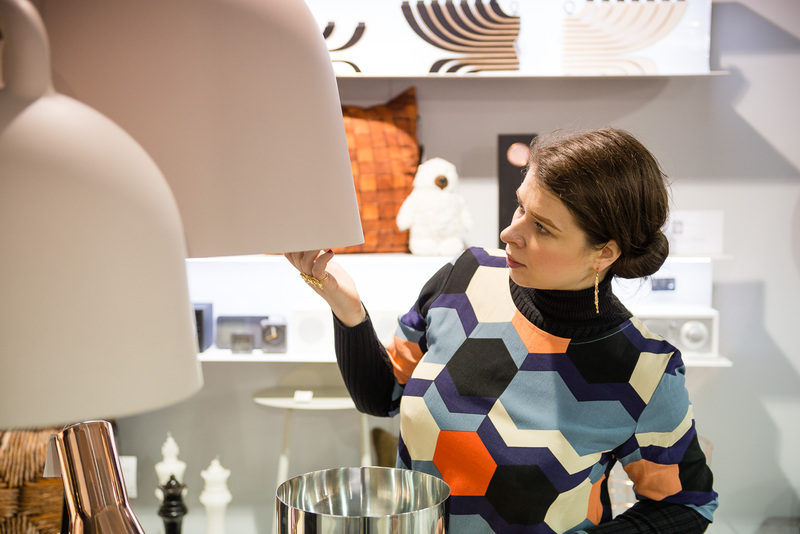 These giant, ceramic ‘bell’ lighting fixtures took my eye – their soft palette and organic shapes felt a bit like ‘Devo’ helmets, too! A very tempting place to browse for unique pieces to furnish your new Central South Yarra apartment. After all that walking, my tummy started to rumble and my mind turned towards returning home for morning tea. 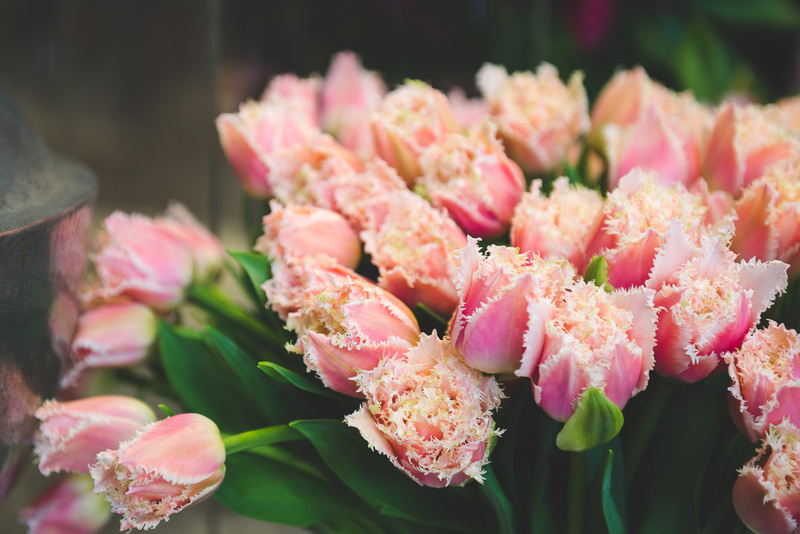 But first: flowers! 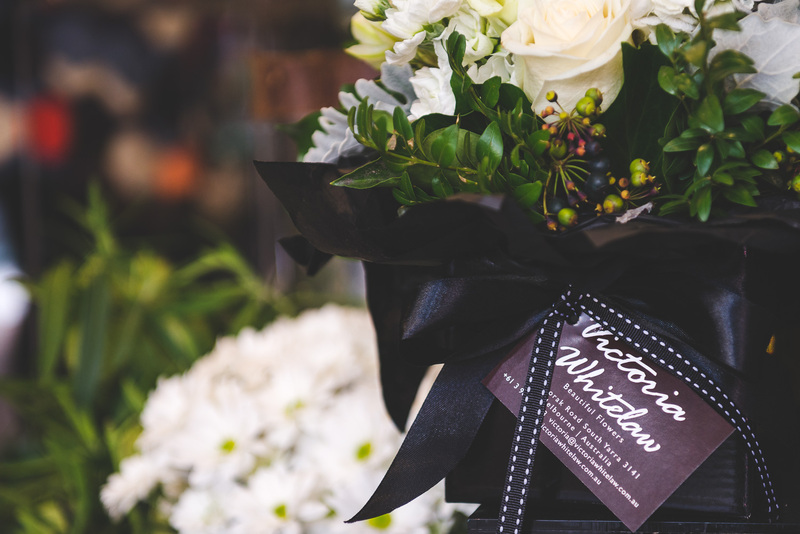 Walking east up Toorak Road past hairdressers, boutiques and hip men’s barbers, we stopped in at Victoria Whitelaw: Beautiful Flowers. 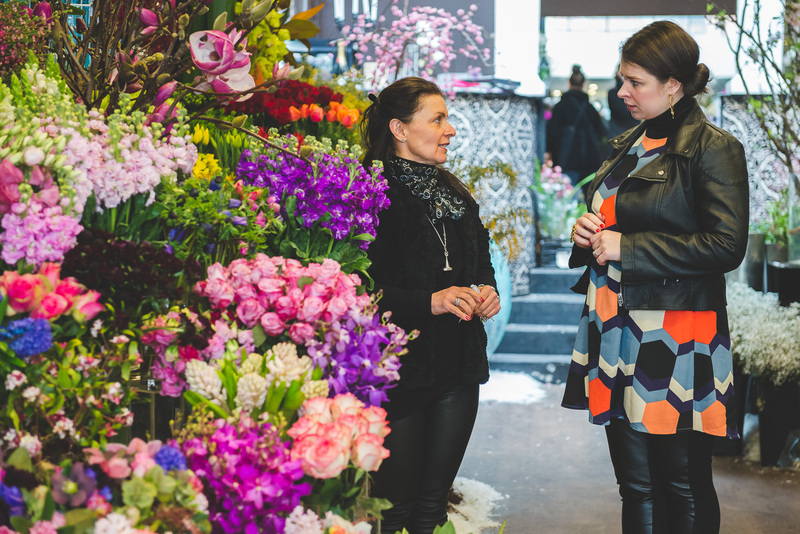 A legendary florist of the southside, Victoria’s business is a veritable Aladdin’s cave of beautiful blooms. Featuring carefully curated seasonal displays (there were mounds of fluffy white ‘snow’ nestled around her flowers on the day we visited), the scent of her business is intoxicating. It was a pleasure to chat with Victoria about her business and the changes she’s observed as a younger generation move into South Yarra. 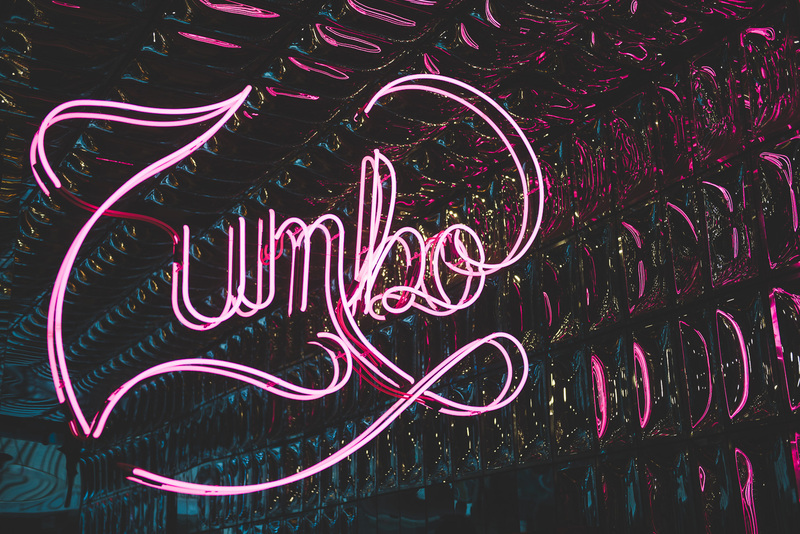 Conveniently located just a block from Central South Yarra (perhaps a little TOO conveniently if you know what we mean), Adriano Zumbo‘s South Yarra premises are a feast for the senses. 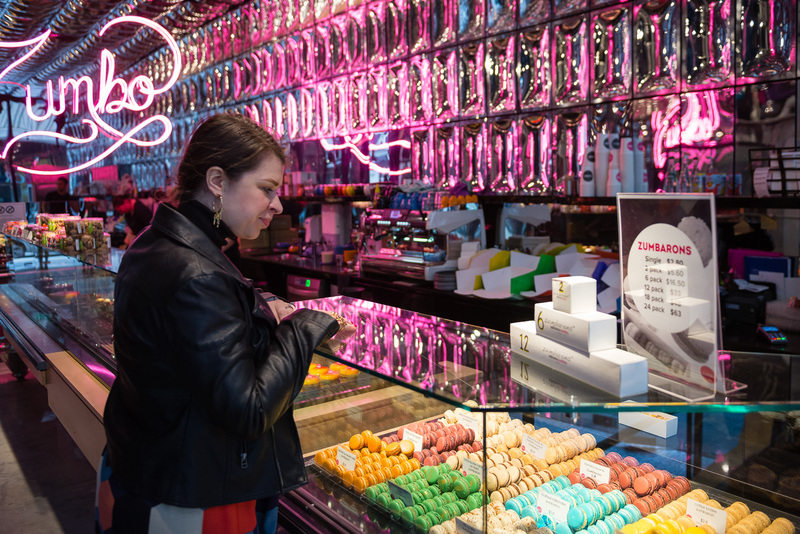 With a mirrored shop fitout rich with bright neons and cool blues, his signature macarons pop like gems from their brightly lit cases. What to choose!?! We settled upon peanut butter and toasted coconut, salted butter popcorn and drunken pear. 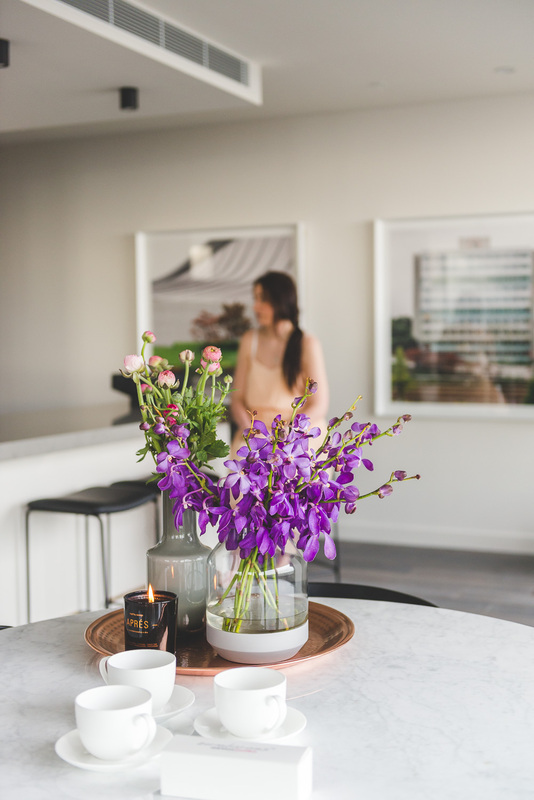 One thing is for sure: there will always be something impressive to offer your guests next time they decide to ‘pop round’ to your gorgeous Central South Yarra ‘pad! Coffee? Check. Exercise. Done. Browsing, flowers and sweets? Tick, tick, tick – that’s what we call a perfect ’10 Minute Suburb’ location! 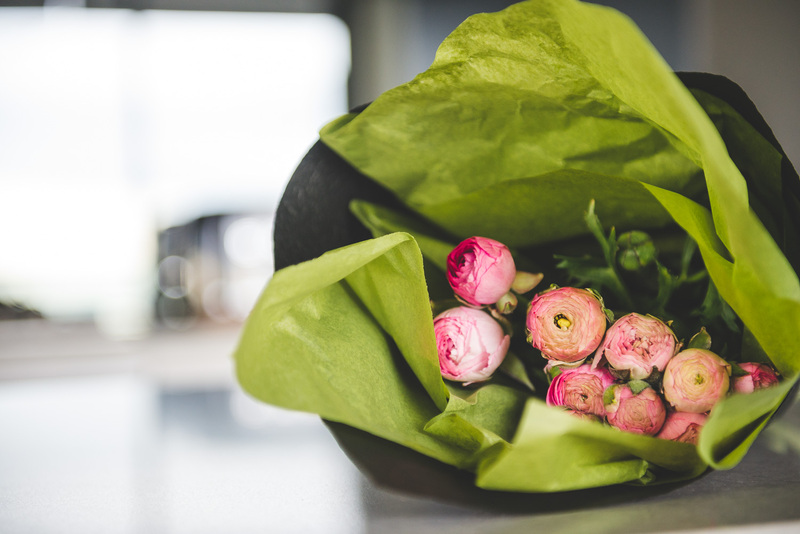 Now back at our apartment it’s time to arrange those beautiful pink Victoria Whitelaw ranunculus and pop the kettle on. 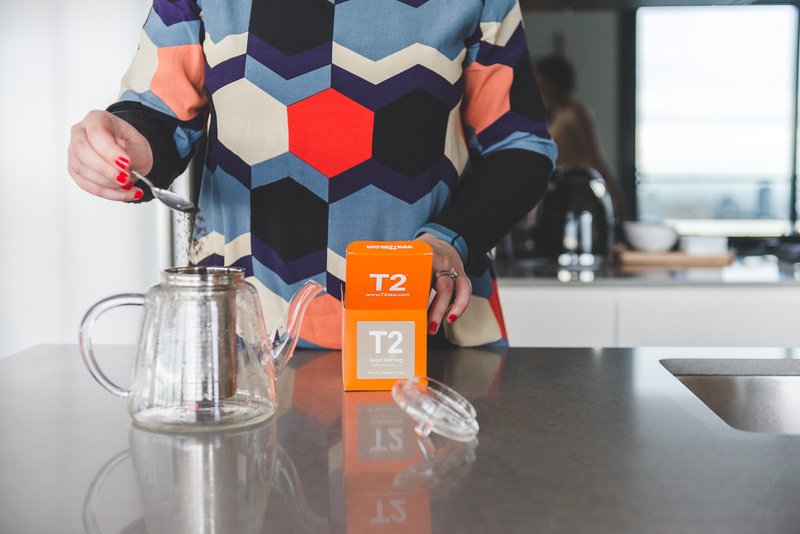 Good Morning blend by T2 steeping, I swirled the tea leaves while looking out at our incredible view of the city skyline as a drizzly day set in. Home just in time! 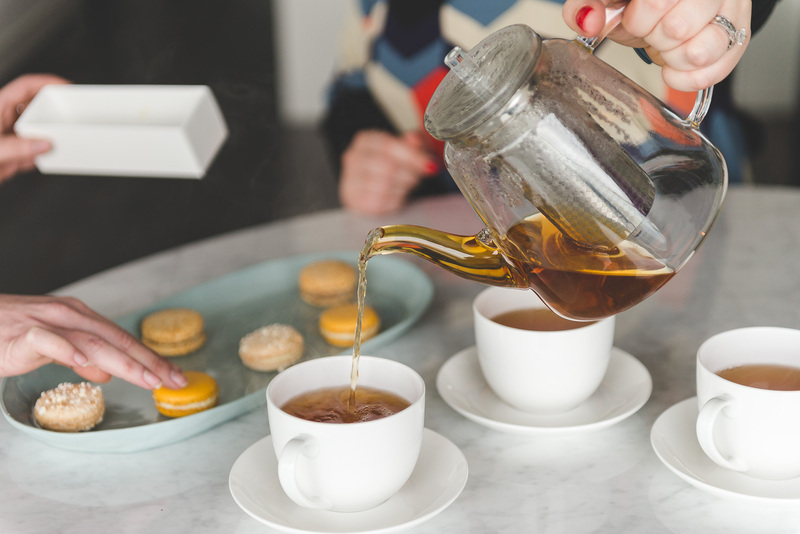 Tea for three? Mais – oui. And a special limited-edition Top3 By Design Apres candle into the mix for good measure – throwing a scent of vanilla, tonka bean, caramel and birch tar around our beautiful lounge room. 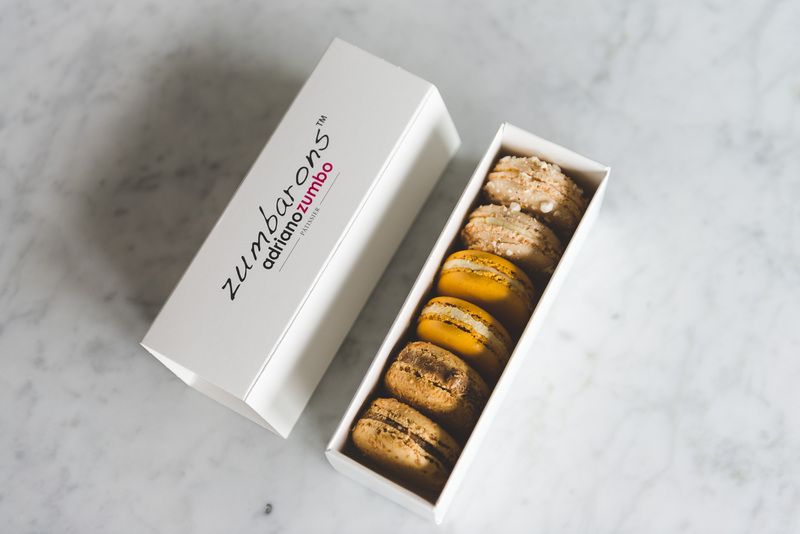 That caramel scent complimented a Zumbo morning tea perfectly. 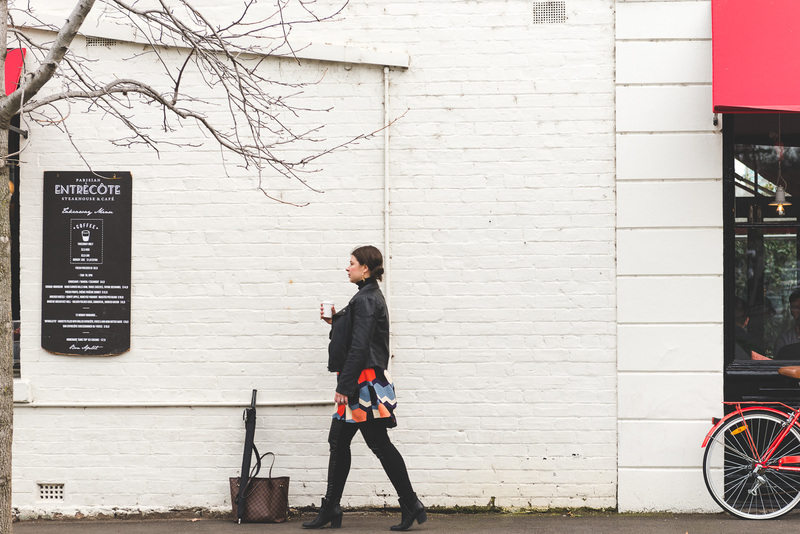 And thus ends your morning with Hometruths Melbourne – having explored our ’10 Minute Suburb’ of South Yarra, we can safely say that when you live at Central South Yarra – you won’t need your car keys any time soon. 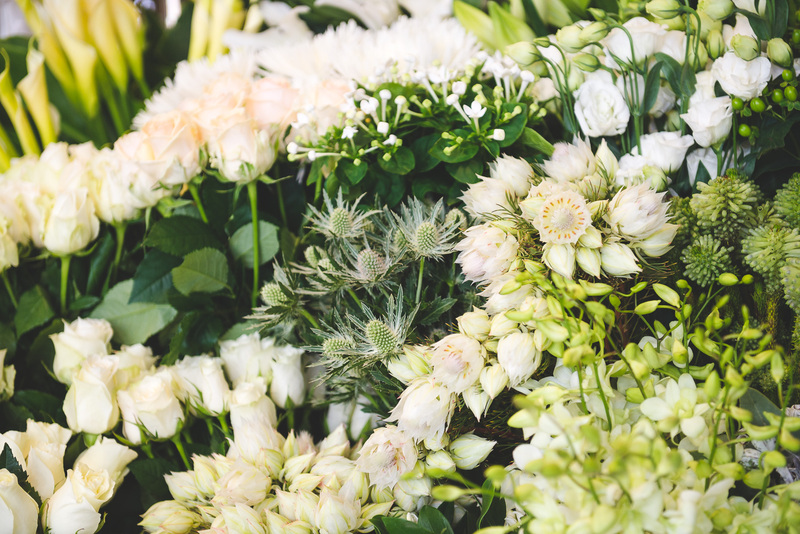 With provedores from florists to gallerists to hairdressers and booksellers, Toorak Road offers all you need for a perfect morning stroll. 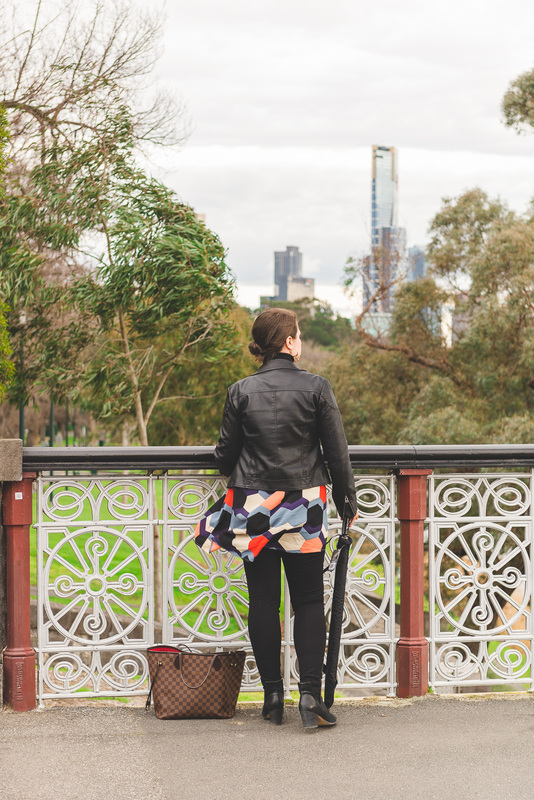 Additionally, living so close to running, walking and cycling tracks along the Yarra River and the Botanical Gardens which take you directly into the city means there’s more time for socialising and enjoying all that Melbourne has to offer – rather than being stuck in your car or on a train. Inner-urban apartment dwelling is an increasingly popular and sustainable way of living that offers huge opportunities for rich community engagement. Living close to where you work and play literally adds hours to your day – meaning that you have the chance to pack more adventure, learning (and possibly Netflix) into your life. 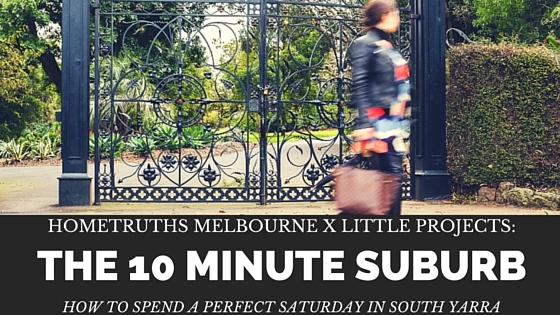 Our verdict on the ’10 Minute Suburb’ of South Yarra? 10 out of 10! A clean, bare white wall is before you. Perfect in its smoothness, crystalline and unblemished. In your hands are a hammer, a nail and a whole lot of hoping that the precious picture you’re about to hang a) doesn’t fall off the wall and that b) you don’t irreparably damage the wall in question with your newbie art-installation efforts. 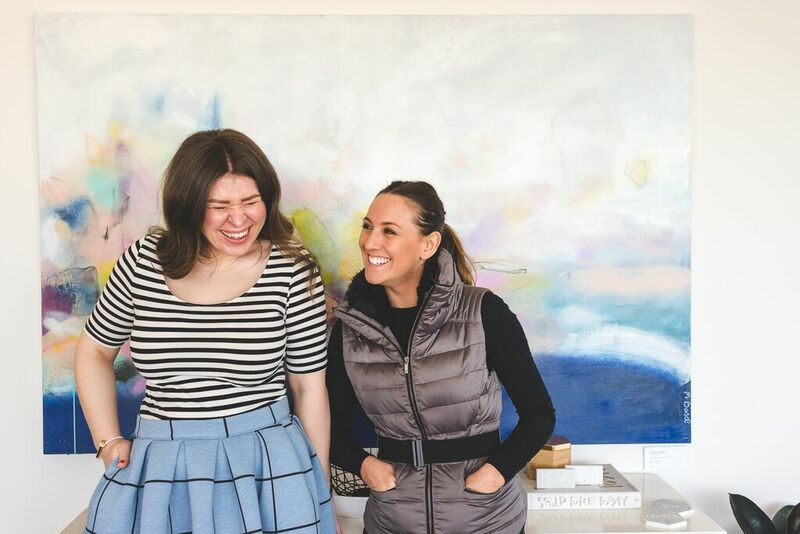 Before you begin – or if you’ve been reluctant to hang artwork in your home because you’re worried you don’t have the requisite skills – read the first in our Hometruths Melbourne x Little Projects blog series: Hanging Artwork with The Real Estate Stylist. This week we’ve been experiencing life and interpreting a new way of Melbourne living at Little Projects’ new development, Central South Yarra. 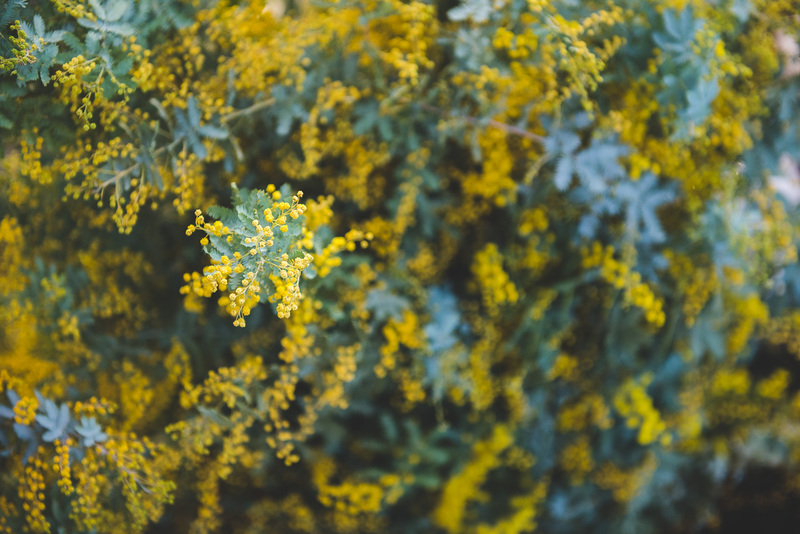 For more on how this Australian-first blogger-developer collaboration came to be, head over to our sister blog, Ruby Slipper. 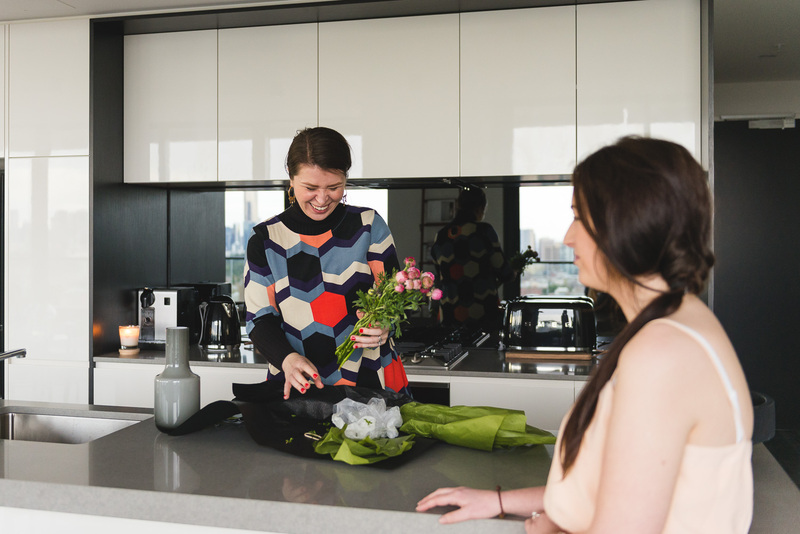 In short, Hometruths Melbourne have been working and living at a beautifully curated apartment at Central South Yarra, brought together by industry legends The Real Estate Stylist and numerous designer partners. 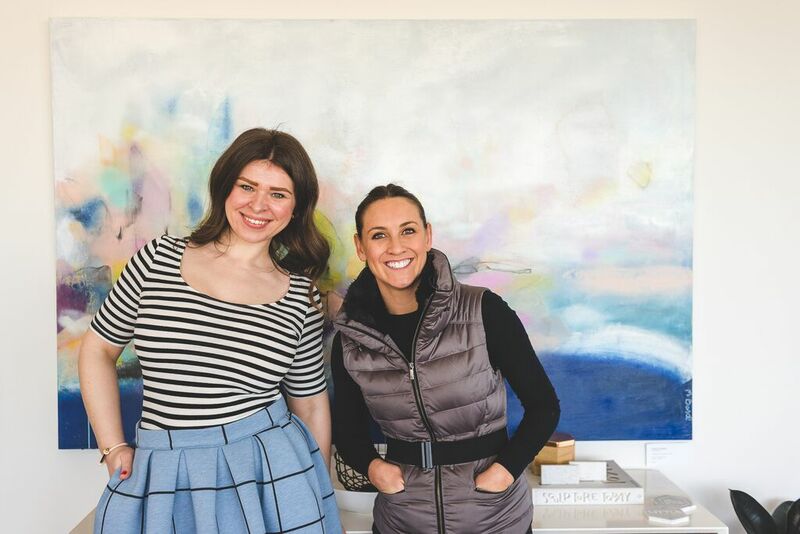 As part of this project, we took time with one half of TRES – Sara Chamberlain – to discuss how to hang and balance artwork in your home. 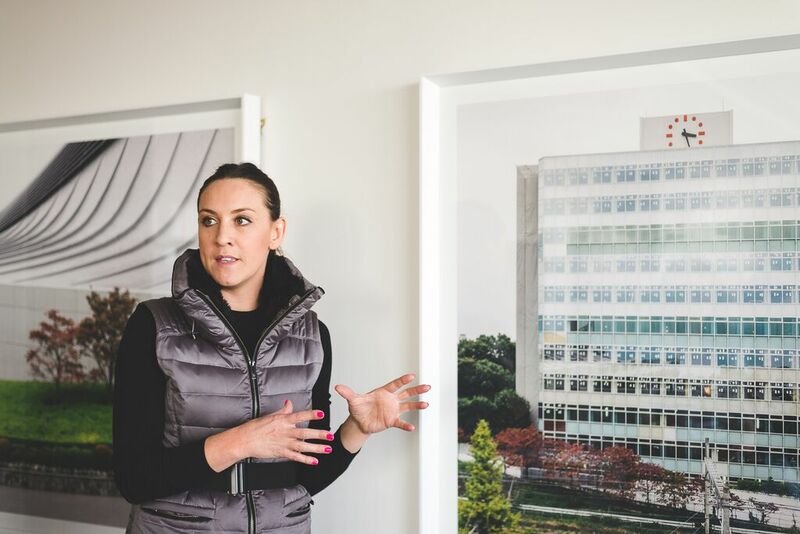 Sara certainly know the ins-and-outs of hanging art – as TRES’ sister business, The Artwork Stylist, prides itself on offering crisp, modern photographic artworks ready-framed for your home – certain to elevate any living space once hung. And hanging the work? That’s where you come in! For artworks to really ‘sing’ in your space, they’ll need to be level-set (square to the wall and floor). 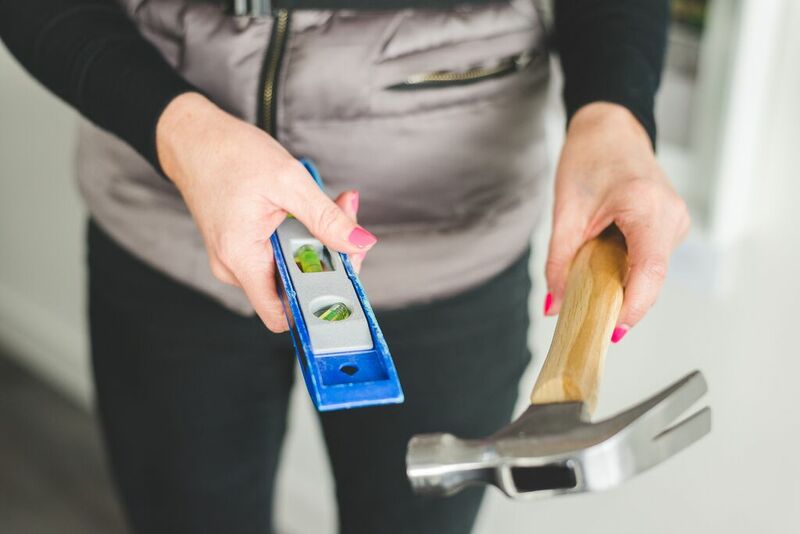 First things first: you’ll require basic tools including a quality hammer and leveller. (Your local hardware store will be able to help you out with these). Find the middle point of your artwork and then measure 20cm out from its middle point on either side against the wall. If your work is particularly sizable, you might need to use a long leveller for accuracy. Create your line on the wall, and make sure it’s straight. Always test your marked ‘holes’ with a leveller before you bang them into the wall: measure twice, cut once as the saying goes. Sara carefully hangs artwork ‘The Secret Life of Trees’ by Richard Claremont in the Living by Little Projects apartment, next to a TRES-selected Norr11 Mammoth Chair by Meizai. Have a heavy or large work to hang? Use D-links rather than nails – not only for their weight-bearing qualities, but because they assist in accurately lining up art on the wall. Use a long leveller, and remember to take into account the space you want between pieces if hanging multiples. Always err on the side of caution when choosing your hanging hooks (picture below). If your artwork weighs 5 or 6 kilos, use an 8 kilogram hook to make sure the plaster will be able to hold your artwork’s weight. Different plasters can bear different weights, so investigate the kind of plaster your walls have (if possible). Newer builds tend to have plaster sheet walls, whereas art deco and heritage homes have plaster rendered over brick. Have a brick and plaster wall? Choose a cement hook – which is a three-pronged hook – which is fantastic for supporting art on these walls. If you’re hanging anything over 5 kilos, you’ll need to use a drill to firmly, deeply embed your hooks. If plaster appears weak or flakey, don’t attempt to stick art on the wall using adhesive – this will definitely damage your wall. 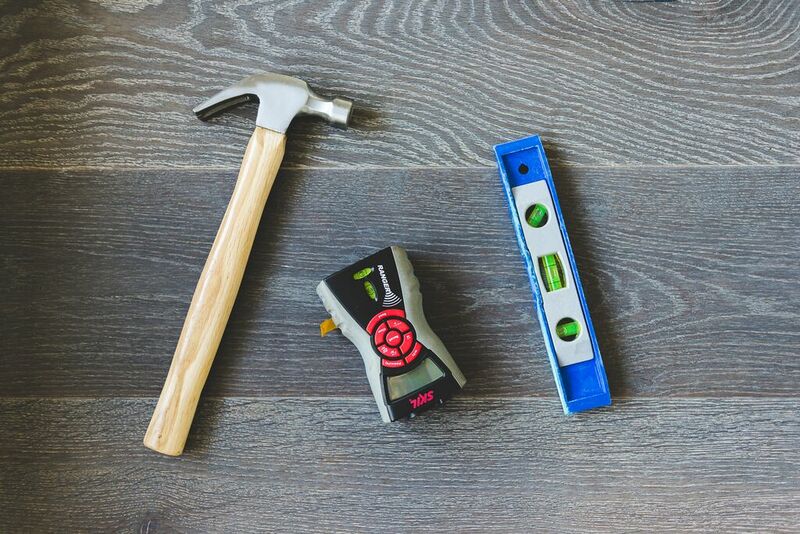 Tool time: hammer, electronic meter tool, leveller. When hanging one piece of art on a blank wall as a single feature, measure the floor to ceiling height as well as the width of the wall. Take care to center the work in the middle of the wall for optimum effect. 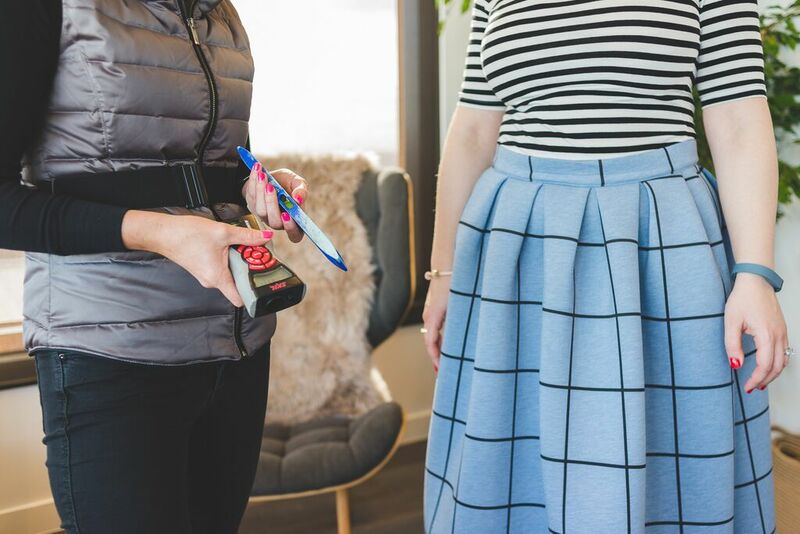 This is where an electronic meter tool come in handy – as sometimes high ceilings and wide rooms are too long for your tape measure to accurately gauge. People used to hang art on inbuilt studs – a practice now (thankfully) mostly outdated. Hanging on inbuilt studs means that the location of your art is dictated by the location of the studs. Always choose your artwork’s positioning based on aesthetics and not convenience. Sara’s extra-big leveller in a rather fabulous shade of raspberry pink. Here, she measures ‘Island Hopper’ by Michael Bond, specially commissioned for the Living by Little Projects residence by Fenton & Fenton. The apartment is furnished in a contemporary mixture of soft and hard natural elements enhanced by artwork, and beautiful books and accessories by the likes of Top3 by design and My Bookshop by Corrie Perkin. People often find it hard to get large canvases on the wall. Make an easier job of it by placing hooks far enough along the width of the artwork to easily slip your hanging wire over them. Measure your rope or wire carefully – remember that rope ‘gives’ more than wire – and make sure its length matches on both sides. Select D-links for hanging canvas – they are the most precise hanging option. 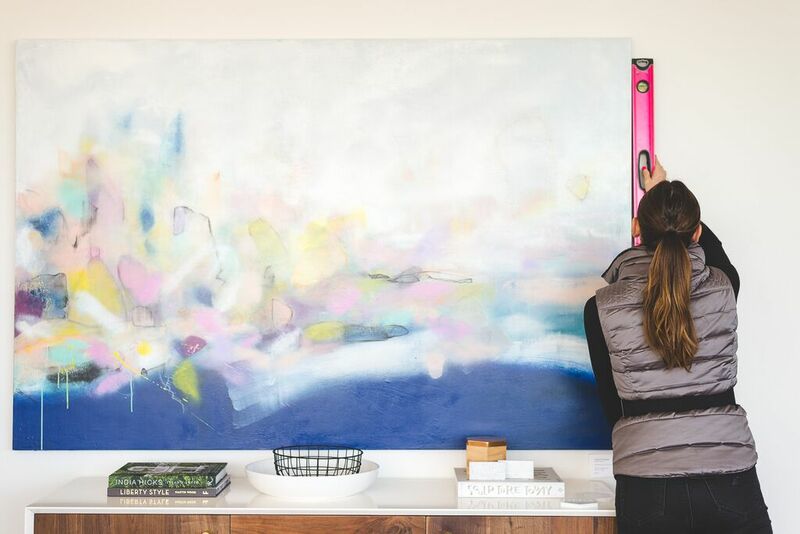 It’s easiest to hang a large canvas with a partner – if your rope or wire is too taut you may end up pushing the artwork against the wall to ‘grab’ the hook with the wire. This will damage your wall – so instead, work with your hanging partner to place wire over hook. Just quietly, I’ve got my eye on ‘Paradise Pink’ from The Artwork Stylist. I asked Sara how best to hang a work of this size (120 x 84 cm) on modern plasterboard. Sara: ‘Paradise Pink’ is not large – but you will still need 2 two-prong hooks. Two-prong hooks are always a better option for small art – you’re putting two holes in the wall, but it really creates a better hang. 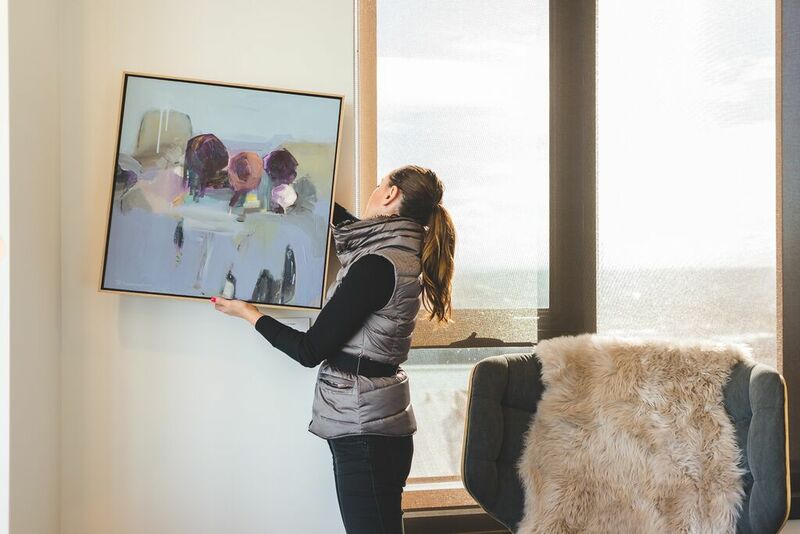 Don’t worry about putting holes in your walls – the reality is, you need to in order to hang artwork properly! It’s only a hole after all, and it can be patched up if needs be. Place your two-prong hooks 10cm either side of the print’s middle point – use a leveller to get this balance bang on. Made some scuff-marks on your wall when getting your artwork position right? Use a magic eraser to clean up the wall. Just have a go! 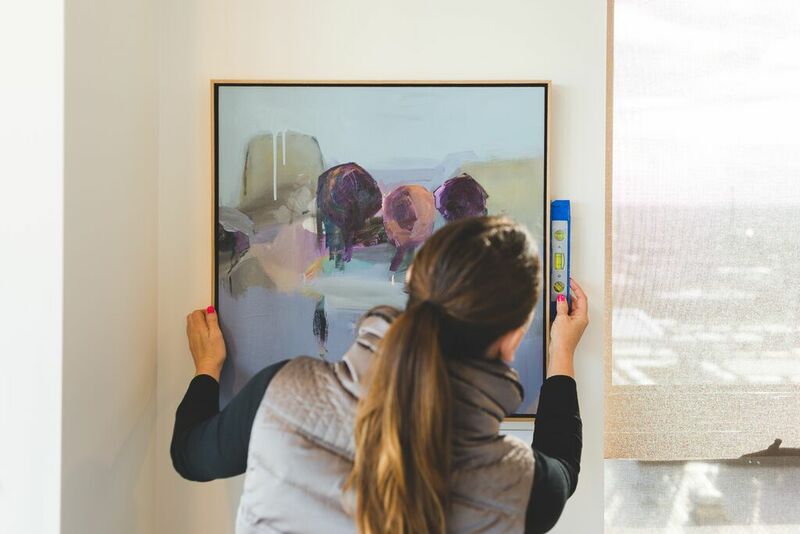 Hanging artwork initially can be a nerve-wracking, but so long as the hooks and weight are right and you’re considering the type of wall you’re working with – you’ll be fine. Placing works higher on the wall elevates ceiling height, whilst placing them lower down makes a space appear cosy. If you have a home with picture rails, don’t hang your artwork directly onto the picture rail – they’re designed to drop down. 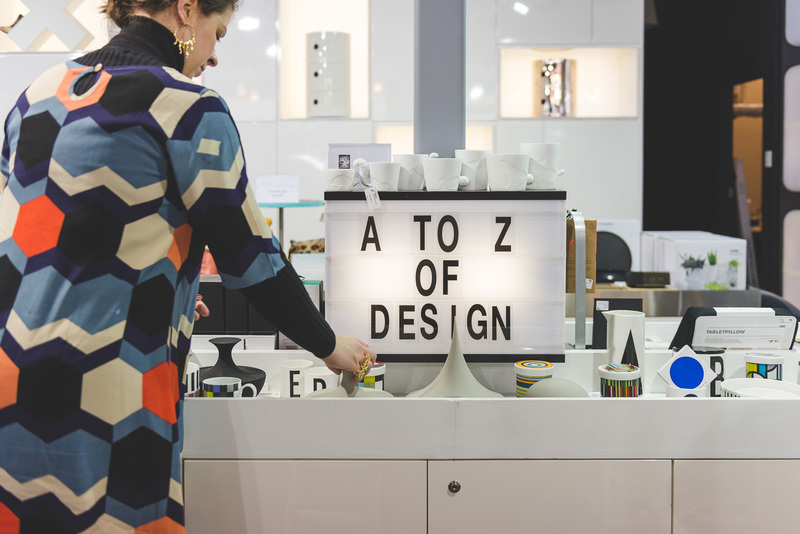 Curious about our time at Central South Yarra? 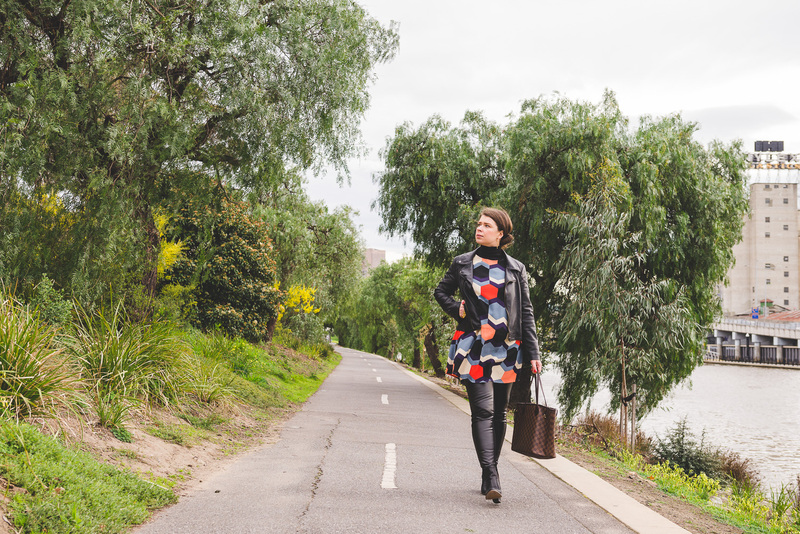 For more on the Hometruths Melbourne and Ruby Slipper x Little Projects collaborations, read on.